Our guild members have created works of art to be raffled off this year to support our guild. We hope you can join us and purchase your chances at these events! This is a generous lap size quilt (70” x 86”) that’s going to be a dream to snuggle under. 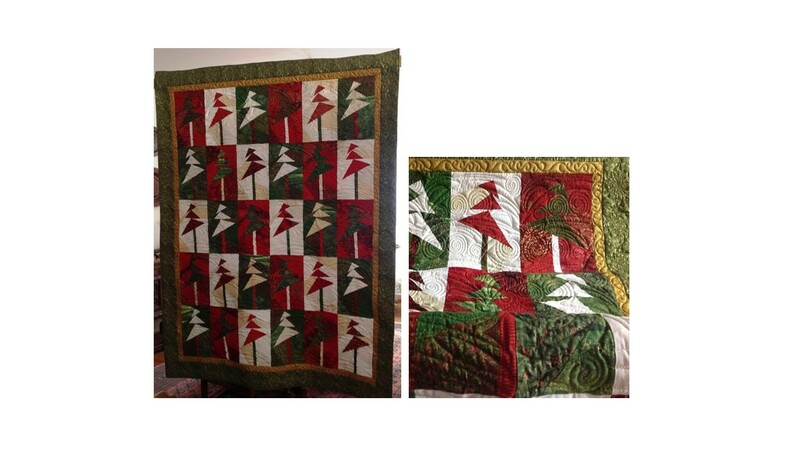 It was made by Marcia Walker and Kay Rice using pieces from My Heart’s “Tree’s Up! Lights On!” pattern. 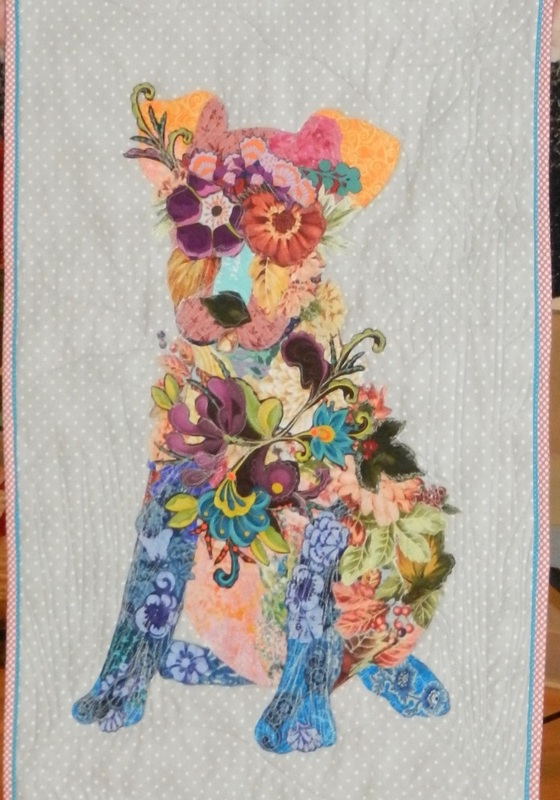 The quilting was done by Olga Schrichte using a Statler Stitcher. Two layers of batting (80/20 and Washable Wool) help to make the quilting pop. Glide thread adds a beautiful sheen to the swirling, curlicue, and snowflake patterns. (Be sure to take a peek at the back! It’s a reversible quilt.) It was fine-quilted at 14 stitches per inch and has a total stitch count of 206,331. Don’t miss out on a chance of winning this beauty! This happy puppy "Emerson" would be adorable in a child's room--or anywhere that pet lovers can admire it! Design and pattern by Laura Heine. It is a fabric collage, hand and machine pieced and quilted by Mary Pauley, 2018. 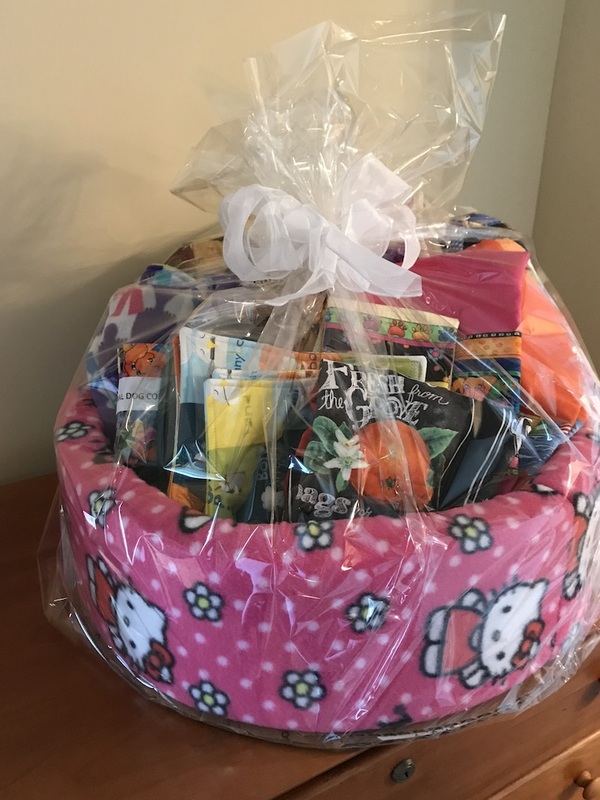 This basket contains items to brighten your holidays, from Valentine's Day to St. Patrick's Day, July 4, Christmas, and more. Click here to view a complete list of items in this basket. 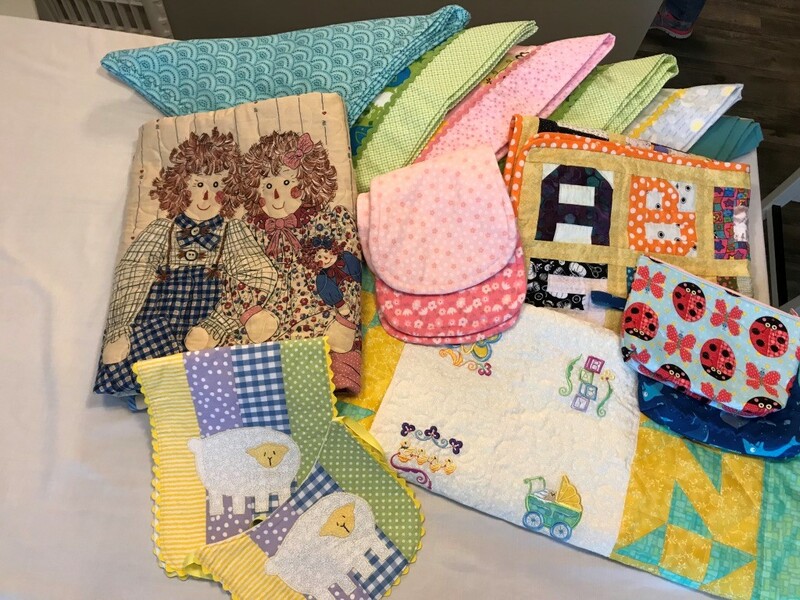 Welcome a little one with this lovely collection of receiving blankets, burp cloths, blanket, bags, etc. Click here to view a complete list of items in this basket. 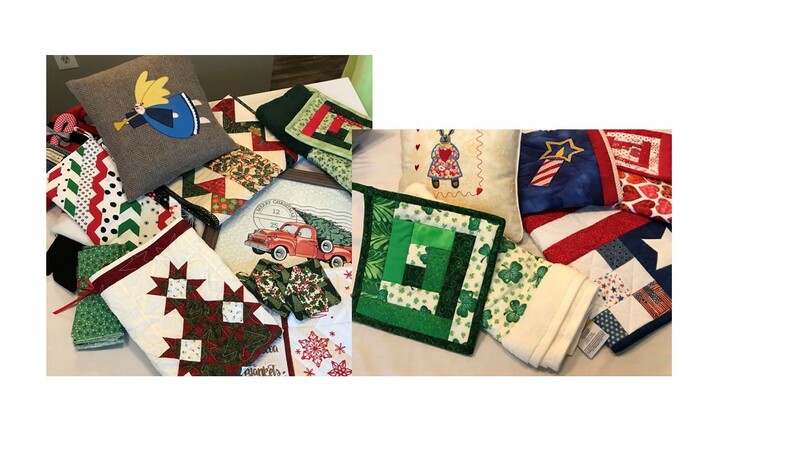 This is a great collection for pet owners that includes a lap quilt, dog tote bag, dog coat, kitty bed, apron, hot mitt, towels, and more! Click here to view a complete list of items in this basket. Red, white, and blue! 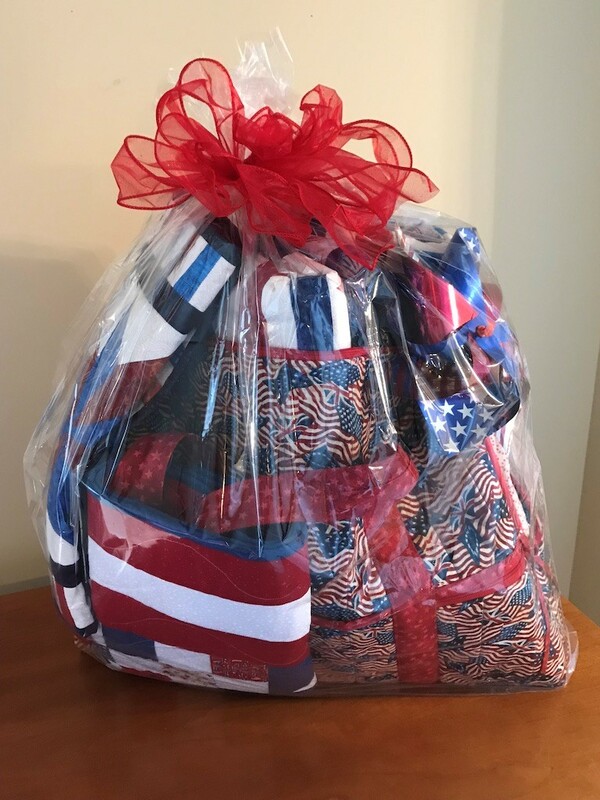 This patriotic-themed basket contains a large star quilt, flag tote bag, table runner, zippered bag, and more. Click here to view a complete list of items in this basket. 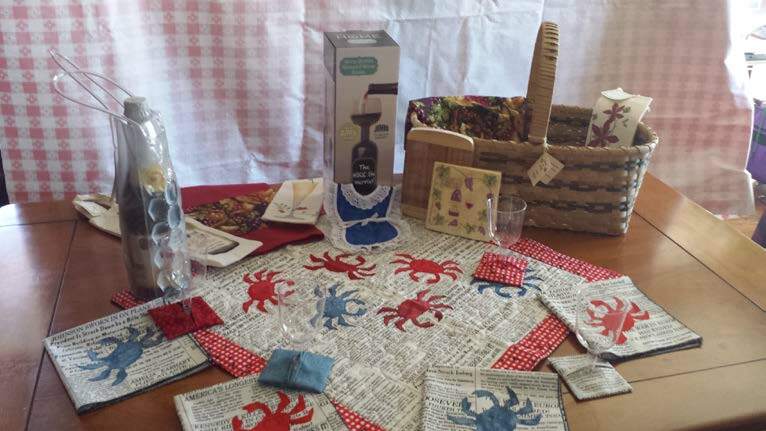 This one-of-a-kind handwoven basket contains eveything you need for your picnic, including a picnic quilt, napkins, win glasses, and more. Click here to view a complete list of items in this basket.